And so it came to pass that after long years of adventuring across the realms of the Hyborian age, the barbarian known as Conan of Cimmeria, and hailed as Amra The Lion by his fanatical followers, became King of Aquilonia, greatest of all the kingdoms of those days. Your Majesty, the people need new coins to replace those of the hated tyrant whom you so mercifully slew by your own hand. For your people do not know you well, and they crave to look upon the face of the one who has saved them from the evil tyrant Numedides. And understanding the need for leadership, reluctantly, Conan agreed to let his image be made upon the large golden "Luna" coin of the kingdom of Aquilonia, subject only to his demand that his face be not smiling nor made beautiful, and that his sigil Amra the Lion be displayed proudly upon the other side of the coin, and to be made even more prominent. So has it been spoken, and so has it been done! The inscriptions were made in the tongue of High Aquilonian Euskaran and inscribed in the Phapian script that was most commonly used in that region in those days, though modern folk may find them difficult. 2014 Conan Properties International LLC (“CPI”). CONAN, HYBORIA and related logos, characters, names, and distinctive likenesses thereof are trademarks or registered trademarks of CPI. Used with permission. All rights reserved. 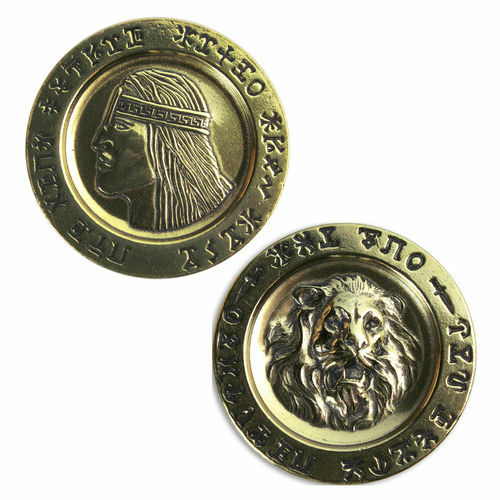 Simply enter your details below and we will send you an e-mail when “SPM - Conan's Coffers - Aquilonian Luna Lion Coin” is back in stock!